MOPS came into my life a year and a half ago, when in reality I probably needed it the most. I was hesitant, not thinking I would make any real connections with anyone. There was no way I had anything in common with these women. I hadn't had a great relationship with God in quite a while, and this was a Christian organization after all, so I was certain all these ladies would look down on me for that. I was afraid of these women, who lets face it, I was sure had it way more together than me, making sure the house was spotless and dinner was on the table when their significant other came home. I knew their kids all got along and were angels, and these moms were going to look like they just stepped off the pages of a magazine. Fear. Anxiety. Panic. Trepidation. Dread. Should I go on? Think I'm crazy?? I'm pretty certain I am at times. All these crazy feelings just because my friend asked me to go to a meeting with her. Looking back, it seems insane. 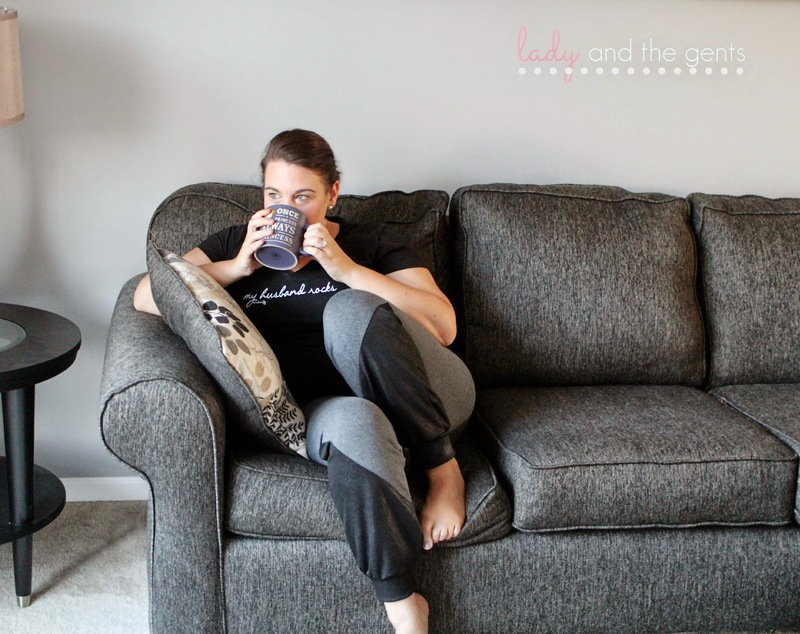 But after reading Brave Mom: Facing and Overcoming Your Real Mom Fears by MOPS CEO Sherry Surratt, I realized I may not be as crazy as I thought. Ok, confession......I have had a long time struggle with anxiety. I've dealt with this for as long as I can remember. As a child, I would sit for hours, pondering what I should say in a situation. A friend would be talking about something, or my parents would be having a conversation, and I would respond quickly, and then sit and think for hours, sometimes days, about what I would really want to say, too nervous, too anxious to ever say what I really wanted to say. Always fearing what they would think. See, fear has ruled my life for a long time. And now as a mom, fear is around me all the time. I fear for my kids, for my husband, for my dog, for my home, for my family. I fear what others think when they see me, or what they think about what I say. I fear that I won't be able to hold my tongue when I really need to, or that I will sit frozen, unable to speak when it really matters. Brave Mom talks about all of these things. I will be honest, it is refreshing to read that other moms in the same season of life as me, have these exact same fears. It is comforting to know I'm not alone. And the best part is that this book doesn't just say we all have fears, it's ok, just keep on keeping on and you'll be fine. No, it breaks your fears down, it give you the tools to step back and think about where the fears are coming from. It helps you stop and breathe and deal with your fears. It helps you be the brave mom you really want to be. I don't know about you, but I so badly want to be the mom that others see as put together, that I look like I've mastered being a wife, mother, all around awesome person. And I think it's ok to want that, but we also need to be ok with being who we are, and not fearing that what we are isn't good enough. Sherry Surratt shares her own fears and struggles, as do many other moms in this book. It is interesting to see how different we all are. Our fears, while many are about our children and family members, can be so different. And the way we deal with these fears differ vastly. Sherry talks about how she wanted her husband to think of her as strong and not needing help. I on the other hand, often feel I lean on my husband way too much, often calling or texting him, telling him I'm struggling, that I need a break, that I'm going to scream if the kids don't let me pee in peace! While I was reading this book, highlighter in hand, because yes, that is how I read, I felt I was constantly having that "aha moment". You know the one. You're sitting there and then something just clicks. It's like the missing puzzle piece is finally put in place and you can see the whole picture. This one quote continues to stick with me. Sherry says, " I wasted days beating myself up, only to realize that to be the best mom I could be was the best mom for my kids. They needed me, imperfect, uncertain me. And what was really interesting to discover was that the so-called perfect mom next door wasn't so perfect. She had doubts and struggles and times when she felt like she had no answers at all either. Just because I couldn't see them didn't meant they weren't there." "Aha moment" am I right?!?! For me, I become so consumed with what I look like to others, or what others think, allowing the fear and uncertainty of that overcome me, I forgot what my job is. I chose to have this life. I willingly and happily chose to have three children, to marry my amazing husband, to live in the wonderful town I live in. Why am I so fearful of others and what they think? What I need to focus on is that to the people who really matter in my life, I am everything they need. I was given my amazing kids because they are exactly what I need. And I am exactly what they need! 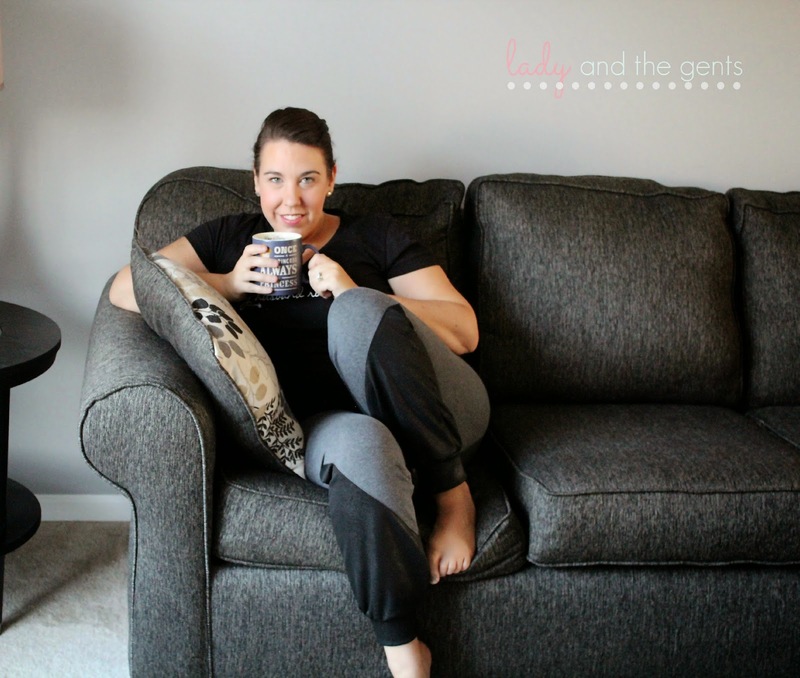 After three kids, my parenting style has changed. I'm sure this is true with every parent, you are constantly evolving, learning, figuring out works and doesn't work for your kids. Sherry talks about this as one of the things better moms do. They constantly educate themselves. I find myself doing this. I am always interested in learning and reading about parenting, new techniques, new studies, anything that will give me more tools to better parent my little humans. Because someday these little humans will be big humans, and goodness I hope I am doing it right! Talk about the biggest fear ever. How do we get these little beings to become amazing productive members of society, who are not only hard working and intelligent, but kind and compassionate? Who understand the world is much bigger than just them and they are here for a reason? I think this is a very common fear among moms. We fear about who our children will become and what kind of life they will live. But as Sherry points out, us moms very often fear these things that are out of our hands. Sure, we can make sure we love and nurture our kids and model what good people should do, but in the end, we all have free will, and our children will do as they please. We can't control what happens years down the road. So instead of worrying about what kind of adults our kids will become, we can focus on the now. Modeling good behavior, talking with our kids about making good choices, and enjoying life. I learned a lot from reading this book. The biggest thing I learned was that my fear is based on control. I enjoy being in control. As a kid, I had control over speaking or not. I now have control over how I look or what I say to others. I have control over my reactions, although in all honesty, this is my BIGGEST battle! I crave control, and in this world we live in, there are many things that are just not in our control. I cannot control the choices my kids make, the way someone views me, the reactions of others. I can, however, control my reactions, my behaviors, my words, my actions. If I spent more time on what I can control, and less time on fearing the uncontrollable, I'm certain my life would be more fulfilling, more rewarding, more enjoyable. Truth be told, I fear a lot of things, and I fear all the time. I am a worry wart. I lay awake unable to turn my mind off, thinking and worrying about what might happen, what I know will happen, what I know will never happen. I am full of fear. But as moms, aren't we all? Don't we all fear that our child will be the one to get into the car with the stranger? That our husband will get laid off not once but twice? (been there done that!!) That a family member will get sick and we won't be strong enough to take care of them? That our children will grow up to hate us? That our kids will get bullied in school? That one day all of our fears and anxieties will eat us alive? Because at this rate, that's exactly what is going to happen. We are worrying ourselves sick. Brave Mom sparked something in me. That not only do I worry about way may than the normal person should ever worry about, but that I am the only one who can change my fears. I can pray, I can educate myself, I can confide in friends, I can just breathe. Breathe.......sometimes that's all we need. A minute to breathe. A minute to center ourselves and come back to reality. To realize that God gives us what we can handle. No more, no less. And that our fears will be ever changing and evolving as we change and evolve. Fear is ever present, but we have the control. We are the ones who decide how we handle it. It's 10:10pm. My husband is at his "fun job" as i like to call it, and my kiddos are sleeping. And here I sit. Still full of fear, but hopeful that maybe things can be different. That I don't have to be full of fear. If you struggle with fears and you'd like to learn more about being a brave mom, pick up your own copy of Brave Mom here. If you'd like more information on MOPS, visit here. You won't regret it. I know I don't! 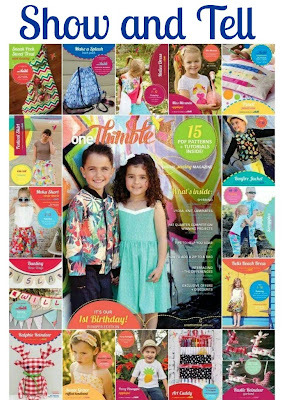 The latest One Thimble sewing magazine has sent me over the edge! There are so many amazing patterns that are perfect for the Holidays! I couldn't choose just 1, so I chose 3 patterns to review. 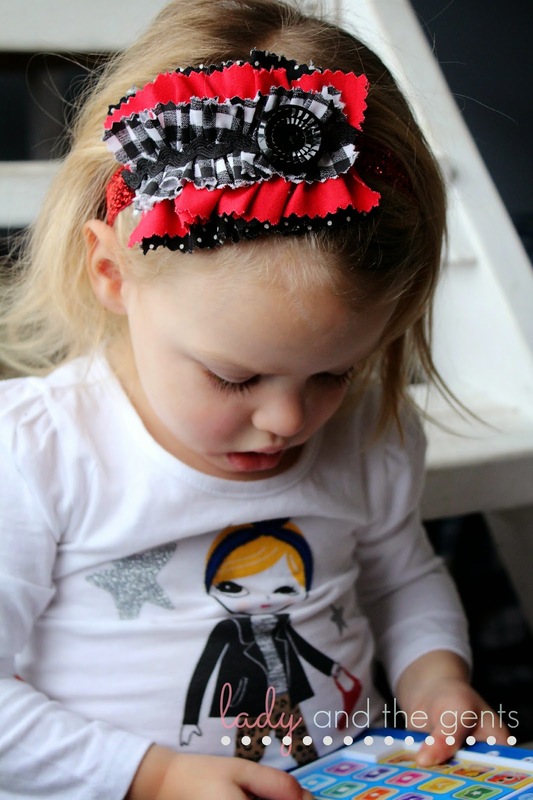 First up is the Sweet Grace Ruffled Headband by Snickerdoodle Stew. This is Jessica's first published tutorial and she did an amazing job! Her tutorial is easy to follow and includes step by step instructions and color photos. The tutorial gives measurements for sizes newborn-adult which is awesome! I really like the look of this headband. The proportions are perfect, but you could easily change the dimensions of each layer if you want. I really like the added embellishments! I will add a cute flower to the next one! There are so many different ideas I have. I will be making a bunch of these for my daughter for Christmas! 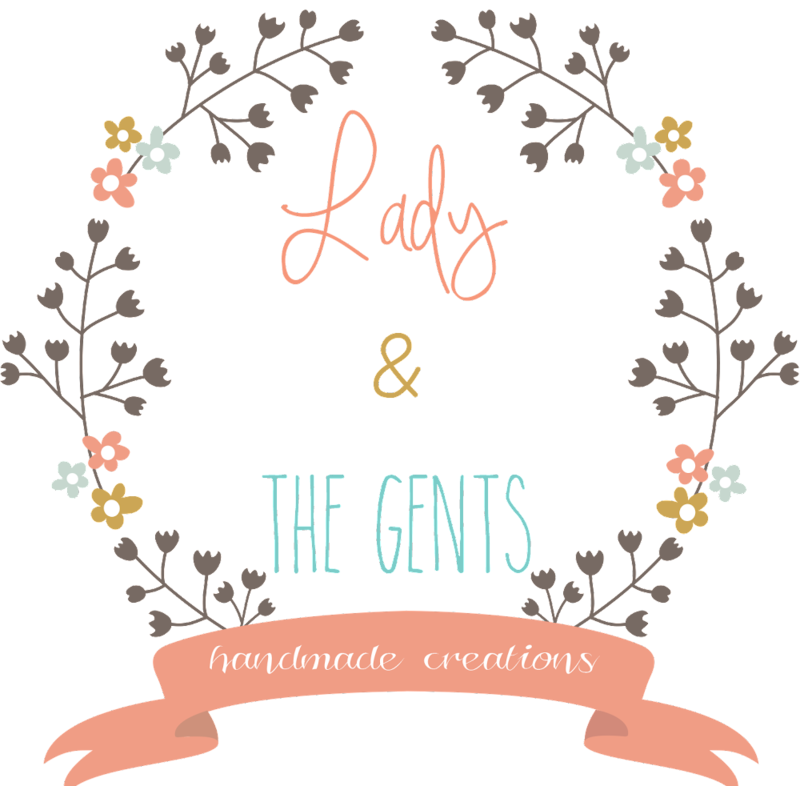 Super easy and fast, and these would make amazing gifts for any lady in your life! We think this pattern is total winner! 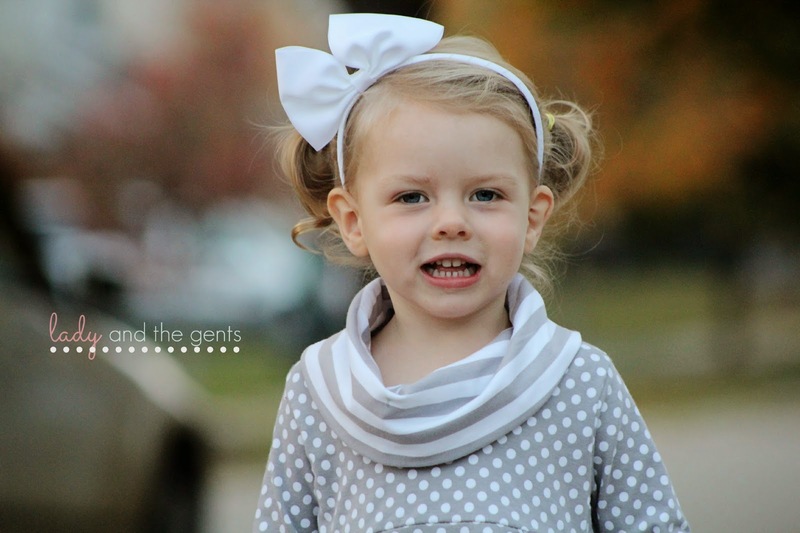 If you are looking for a simple but great looking headband, you can't go wrong with this! Since I made something for my favorite lady in my life, I knew I needed to make something for my gents. And what better for my art loving boys than the Art Caddy by Damaya Designs. Who wouldn't love an awesome art caddy?? These are going to make perfect Christmas gifts for my gents. I will make another in opposite fabrics for my youngest boy. This tutorial is wonderful! The instructions are easy to follow and include color photos which are so helpful. The photos are even labeled to correspond to the correct instruction! This caddy holds a TON of supplies! On one side, you have 9 crayon pockets and a large pocket perfect for papers, stickers, felt. The list in endless! I put some of our favorite glitter foam pieces in there and they fit great! The other side has 12 smaller pockets perfect for colored pencils of the twistable crayons and both medium and small pockets. 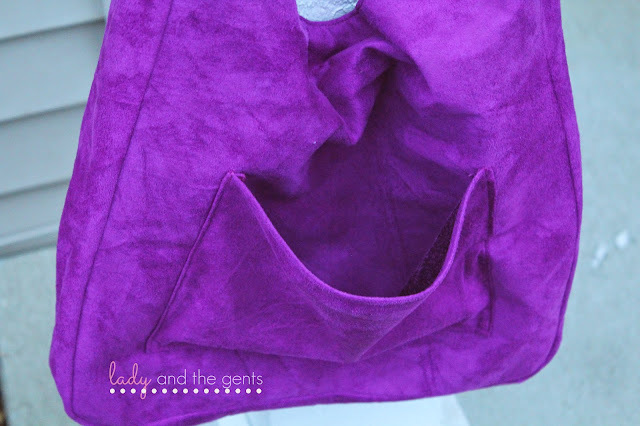 The medium sized pocket is great for a pair of scissors, a small pad of paper or some stickers. The smaller pocket is perfect for a few glitter markers! This pattern is awesome! My boys are going to flip when they open these at Christmas! I mean, who doesn't love art supplies?!?!? These make great gifts for any budding artist in your life! Since I now have gifts for all my kiddos, I knew I needed something to spruce up my house, and the Bunting 3 ways by Willow and the Owl was exactly what I was looking for! Time to deck the halls!! I decided to go with a somewhat non traditional look for my Christmas banner. And since was are a somewhat musical family, I thought this Fa La La La La banner was fitting! This tutorial was wonderful! Very easy to follow with great color photos and helpful hints. I have NEVER appliqued before, and while this in no where near up to my normal standards of work, for a first time I thought I did ok! After looking at the bunting, and knowing I LOVED the look, I decided it would suit my boys' room the best! It's a great addition to their room and will look perfect for the Holiday season! The tutorial includes 3 different shapes, triangle, scallop, and rectangle. It also includes a bunch of different applique shapes to use. I chose to use these super cute music notes that I found during one of my many Pinterest searches! The tutorial also gives great ideas if you are going to applique letters onto the bunting and many helpful hints. This is a great tutorial for beginners! I can see myself using this tutorial a lot for name banners, different holiday sayings, and it would also make a great gift! I will definitely by making more of these! You can't go wrong with any of these tutorials! 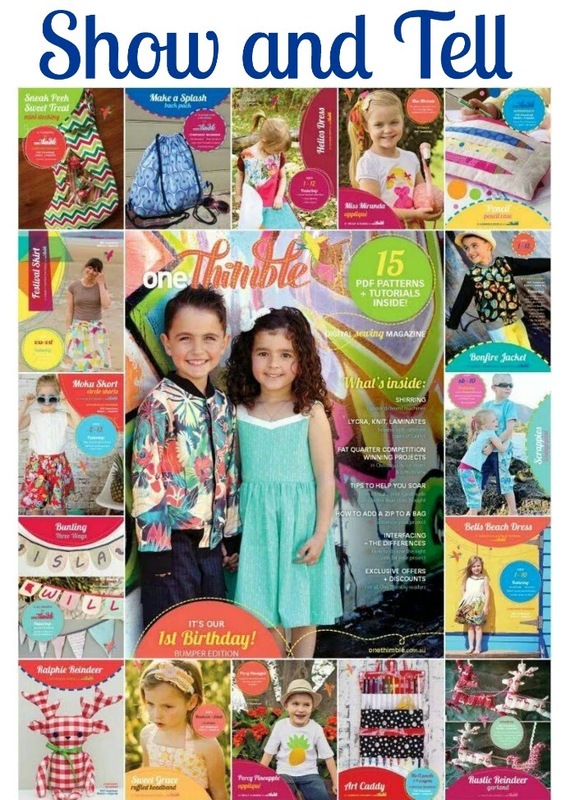 Head on over to One Thimble to pick up your copy of the magazine or single copies of the tutorials now! And don't forget to enter below for your chance to win a copy of the magazine! I love the fall! The crisp air, the first fire in the fireplace, and warm drinks! Makes me so happy! When Jenny from Seamingly Smitten asked me if I wanted to be part of her fall blog tour I couldn't say no! I love everything about fall, and that includes patterns that are perfect for the fall! Seriously, I am in a ton of pain, so much I could barely move for almost a week. Then the weekend came and I was feeling better, until I decided the basement playroom needed to be purged and cleaned. Now I can hardly move again. That brings us to present day. My day is consisting of lots of pain, attempts to get some sewing done, wrangling my two littles that are at home, and trying not to overdo it! Good news?? 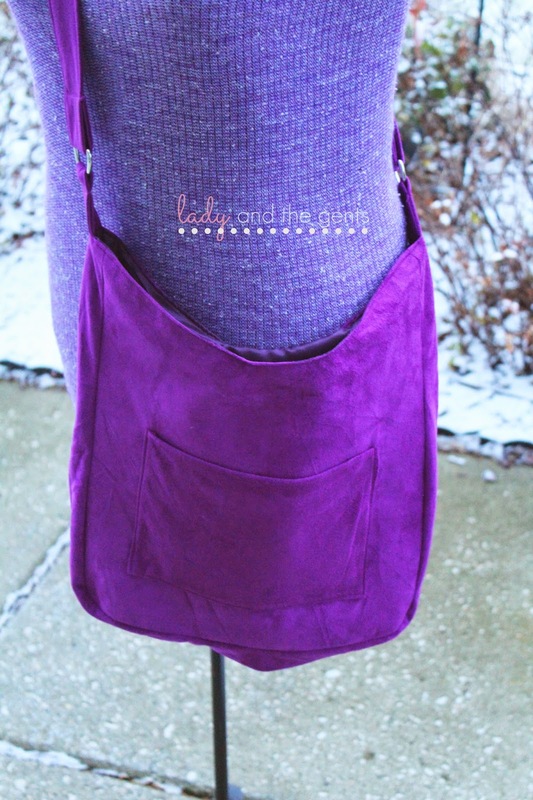 I have an AMAZING new slouchy bag that I absolutely adore! Purple suede???? Yes please! 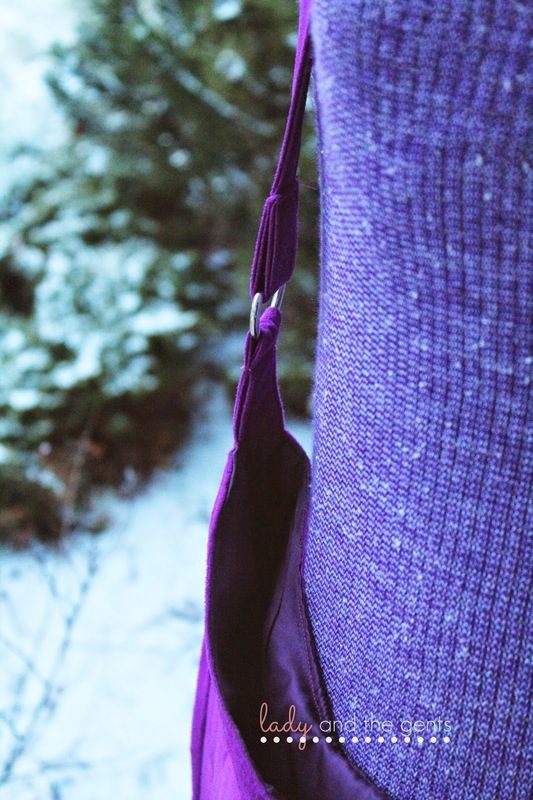 This fabric is so soft and luxurious! And this color is spot on for the fall 2014 color trends! Let's talk pattern specifics for a second. There are only 3 pattern pieces, so the pattern goes together really quick. The hardware you need for this bag are easily found in your local craft store, and you don't need much, just a couple d rings and a magnetic snap if you choose. I decided on no snap for my bag. Jenny gives you instructions to find the perfect strap length to fit your body, or you can go with a few lengths she includes in the directions. I went with her cross back dimensions and they were perfect for me! The pocket on this bag is nice and large! You can definitely fit your phone, keys and a lip gloss in it with no problem! There is also an option to put a pocket on the inside. I did this, and then after sewing realized I sewed the lining piece with the pocket the wrong way, so my pocket is sandwiched between the lining and the main fabric :( That made me pretty sad. But it's ok because I will just have to make another! I was nervous about making a bag with hardware since I normally don't make this kind of thing, but the d rings were super easy to use! And Jenny's instructions are always wonderful and easy to follow. I had no issues except trying to sew through all the layers after inserting the strap into the ring. This was due to the suede and my machine not wanting to cooperate, and had nothing to do with the pattern/instructions. 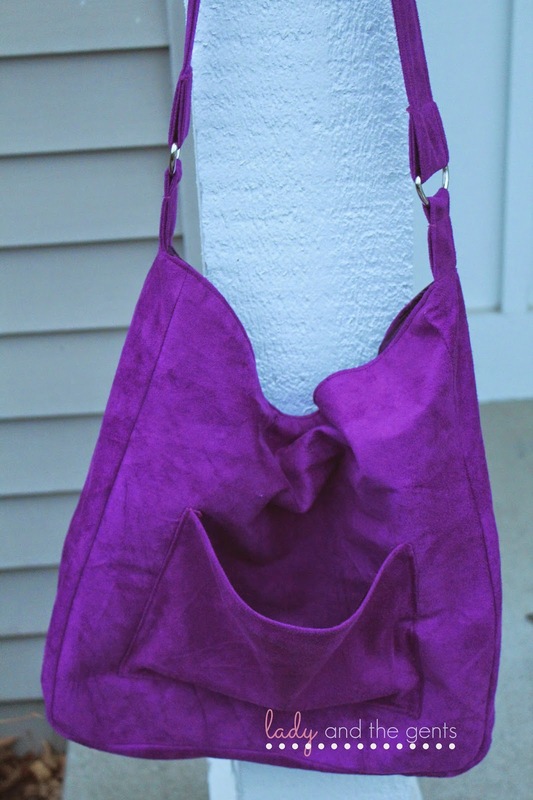 I adore how this bag hangs. 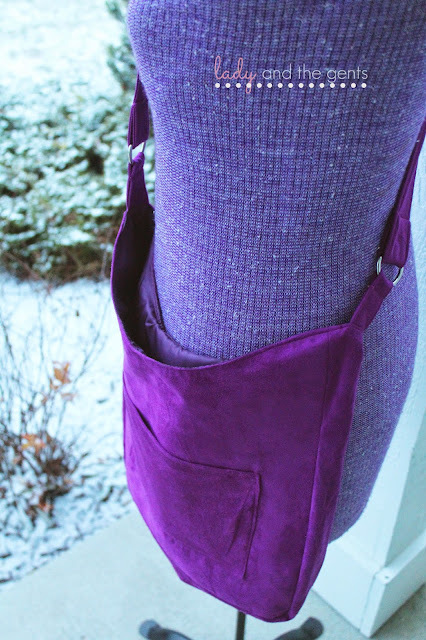 The cross body measurements allow it to sit perfectly on the hip, which is so comfortable and perfect for my since I'm always on the go. And the interior of the bag is huge! This is the perfect option for everyday use! you even have room for a diaper, wipes, and a change of clothes for you little one, plus all your normal purse stuff! I thought this pattern was extremely easy to sew, the instructions were great. 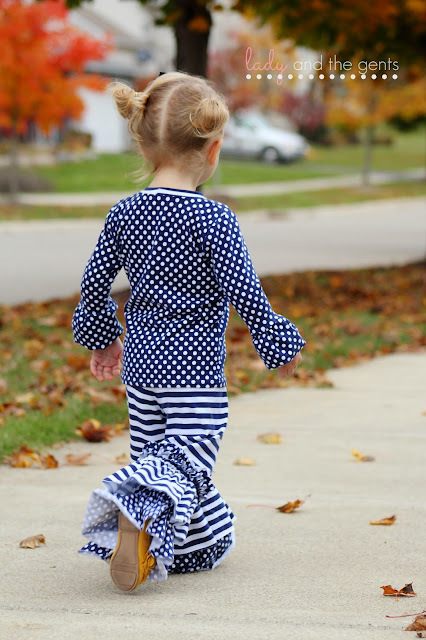 This is the perfect nap time sew! 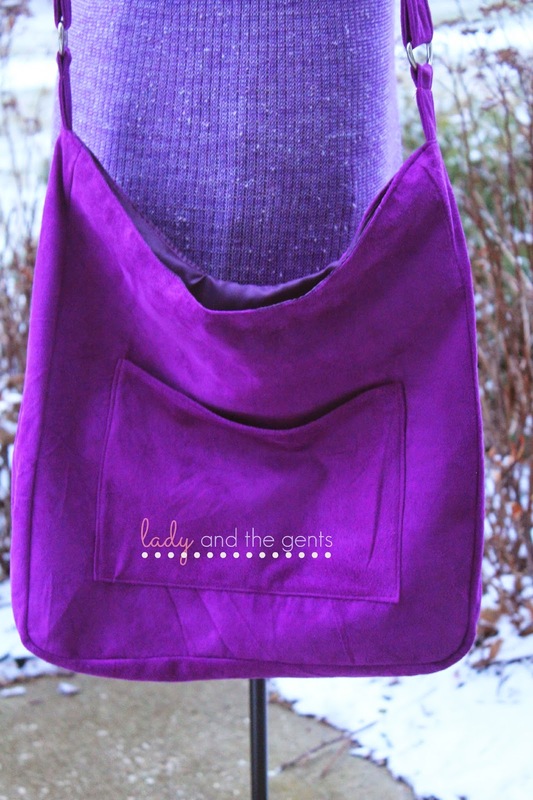 Put the kiddos to bed, sew this up, and you have a new bag to use in time to pick the older kiddos up from school! Need this pattern?? (You know you want it!!) Use code: PATTERNTOUR50 during the entire month of November to get 50% off your ENTIRE purchase!!!! Isn't Jenny the best?!?!? But wait, there's more!!! Enter the giveaway below for your chance to win one of 3 amazing prizes!! The giveaway ends November 24th, so don't forget to enter!! When Suzanne asked me to be a part of this blog tour, I was so excited!! I LOVE testing for her, and had to unfortunately this one out, so I was really excited to finally be able to sew these up! Well, I seriously thought I was doomed this week. My entire family sick, kiddos out of school, disaster of a house, and then like anything else bad could happen, my fabric was late. I honestly thought this post wasn't going to happen. I was not happy, to say the least!!! But, thankfully, the Aviator pants are such a fantastic sew, I was able to sew these up in no time at all, once I had my fabric that is. It made up for all that bad stuff! Who doesn't love a good pair of comy pants?!?!? I am normally a jean kinda girl, but these pants are really awesome! 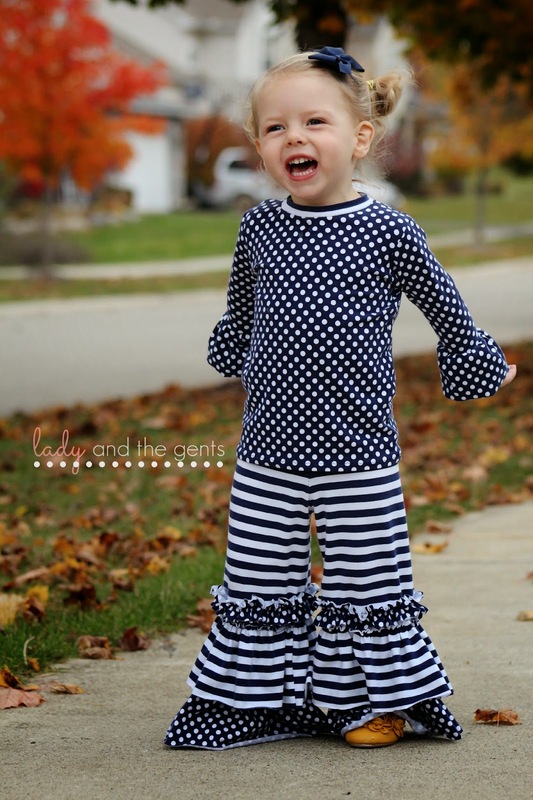 It's easy to say these pants could be made tons of ways for a variety of looks! I decided on the cuffed bottom, no pockets, and regular yoga waistband. The fit on these are great, but if you are in between sizes, or using a super stretchy material and want a more fitted look, size down. I ended up going by the size chart, but after sewing took them in since my material was on the thinner side and very very stretchy!! While on the subject of fabric, there are many types that can be used for these pants. I choose a cotton lycra for the main fabric, and a leather scuba knit for the triangle accent. Try to pick fabrics of similar weights if you are going to do the triangle accents. I also used the scuba knit for the cuffs and waistband. If you haven't sewn with scuba before, you need to. It's pretty awesome!!! Worried you can't leave the house in these? Too much like sweatpants? I really think you have nothing to worry about! Take a second and search "women's sweatpants" on Pinterest. You will be amazed at the styling options for comfy pants! This type of pant is not meant to just lounge around in! It's meant to be shown off! I paired mine with an amazing pair of suede and leather heels and my all time favorite blazer that has leather details! Perfect for my leather aviators! I really love the triangle accents on the pants. And the cuffs are great too! How cute would these be cropped???? 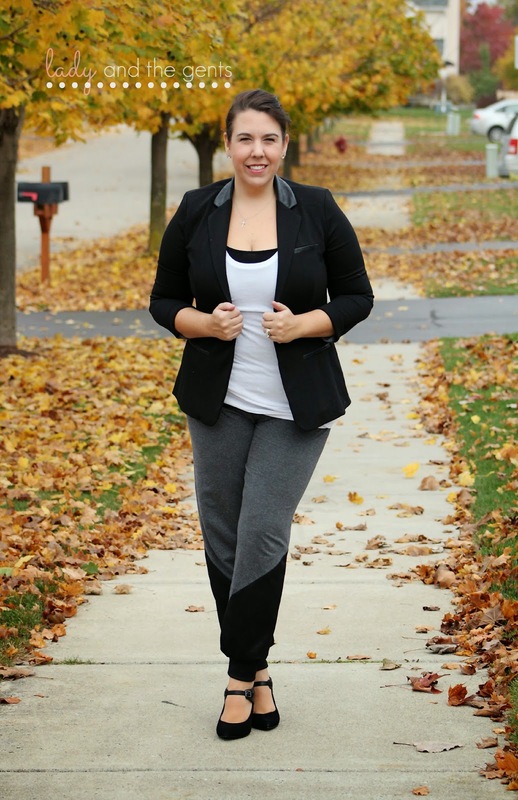 These pants are extremely comfortable and so versatile. 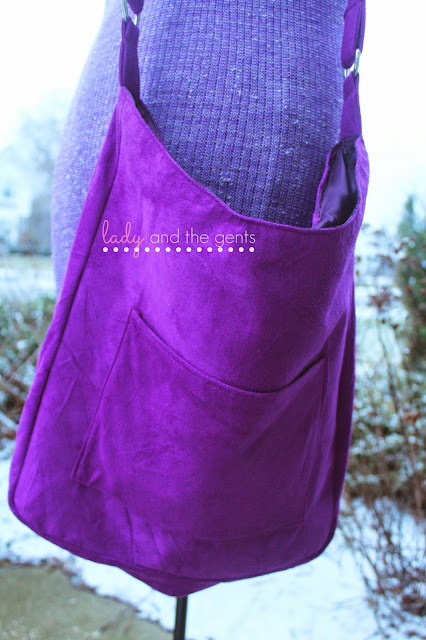 Dress up or dress down, they are a definite need in your sewing arsenal! And if you're looking for a quick sew, these have got you covered! The simplest version; no pockets, no cuffs, regular waistband, could easily take under an hour to sew! 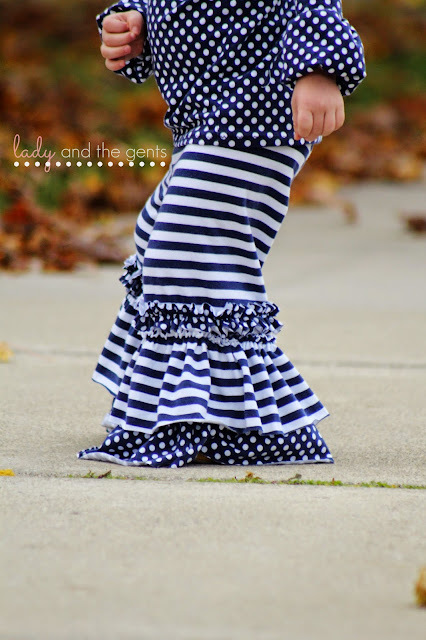 Even with all the added details, these pants are quick and the instructions are very easy to follow. Don't forget to pick up your copy of the Women's Aviators today for 15% off, using code AVIATORTOUR. Or grab both the women and children's patterns and get 30%off! And while you're at it, take a few minutes to check out all the other awesome Aviators on in tour! It's that time of year. The kids are back to school, the leaves are changing, Halloween is fast approaching. We are frequenting cider mills and pumpkin patches. Fall is my second most favorite season! I love all the colors and the cooler weather. And with that cooler weather comes fall clothes, which may really be the best part! 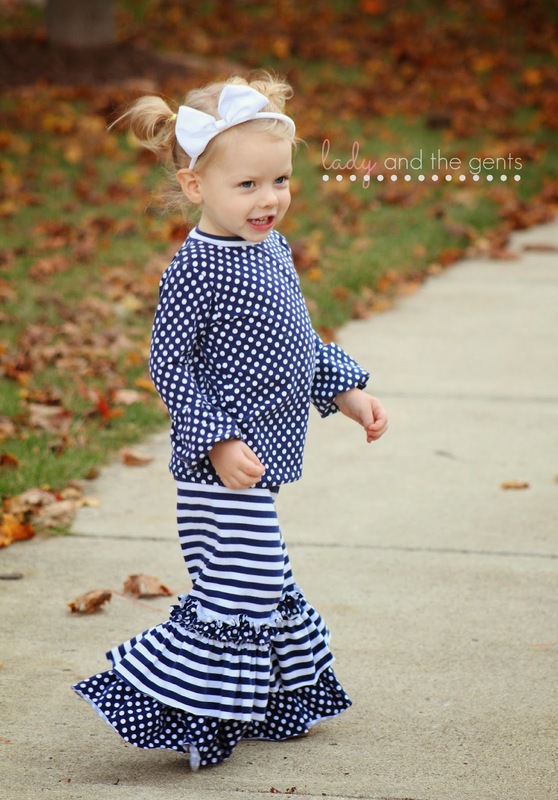 Sweaters, scarves, boots, ruffle pants, tights....I could go on forever! I couldn't pass up the opportunity to be a part of the Greenstyle Focus on Fall Blog Tour, being that I LOVE fall and I LOVE Greenstyle Creations just as much. 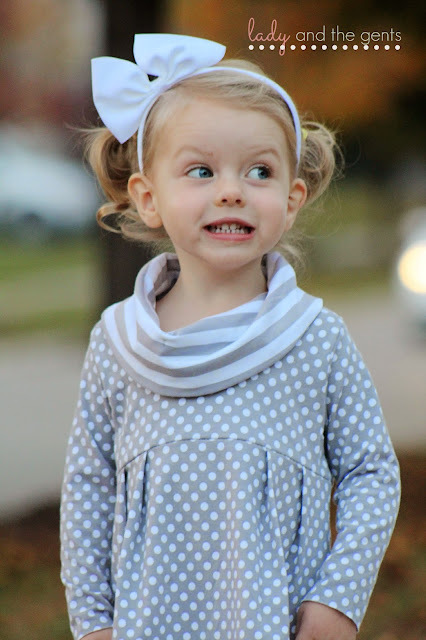 Riley Blake graciously provided all the fabrics for the bloggers in the tour! How awesome is that?!?!?! I will say, I may have done a little happy dance when I found that out ;) And thanks to Whimsical Fabric, there are some terrific prizes at the end of this post! The hardest part for me was choosing patterns. I really wanted to sew something I had not sewn before! I decided on the bella bubble sleeve tee, willow ruffle pants, and the laurelette dress. Yes yes, I know. That's a lot of patterns. But I knew It would be worth it in the end! Seriously, how cute is that?!?!? 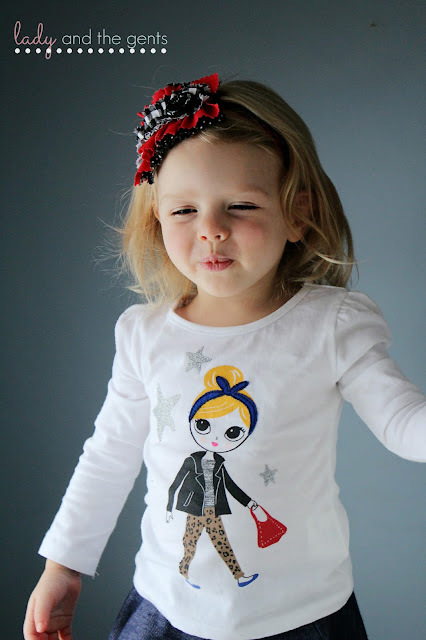 I have had the bella bubble sleeve tee for a while. I actually have had one cut for about a year, but I've never sewn it. I don't know what I was waiting for, because this pattern is great! 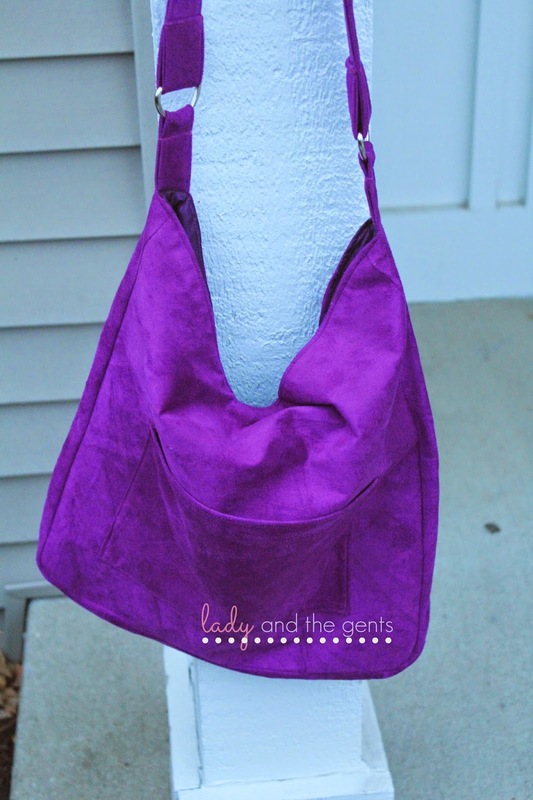 The instructions are great, it is easy to sew, and it is super quick! The fit is wonderful too! I did change up the sleeves a little bit since I didn't have any elastic thread on hand. I gathered the outer bubble without using elastic, and it worked out beautifully! I went with a striped contrast on the inner bubble of the sleeve (take my word for it since I don't have a photo of this) and on the collar, and I love how it turned out. I love the fit! I made a 12month with a 2 length for my peanut. 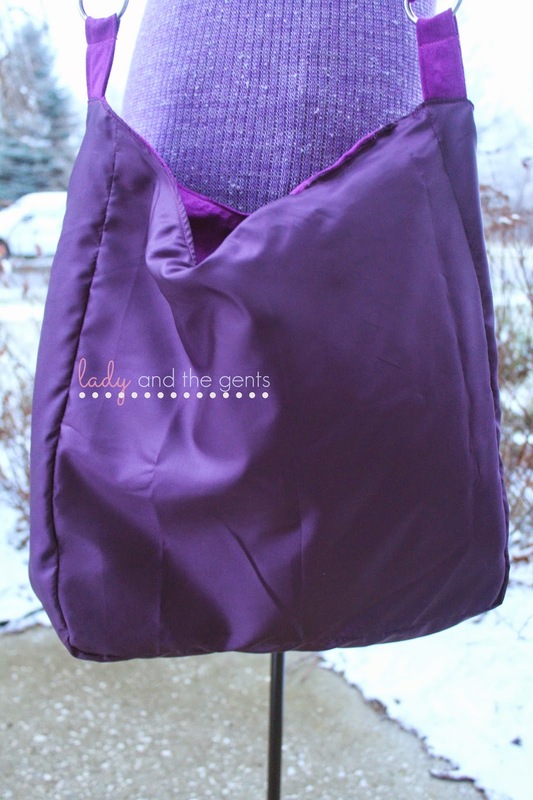 It is perfect and should last all winter and spring!! Should we talk about the pants??? I mean, seriously...these are to.die.for! 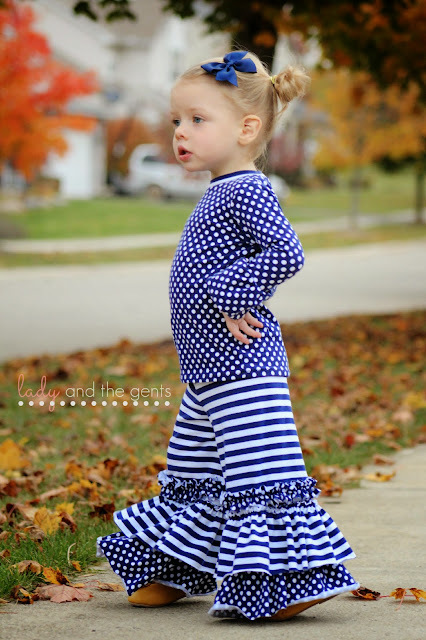 I LOVE LOVE LOVE the triple ruffle. 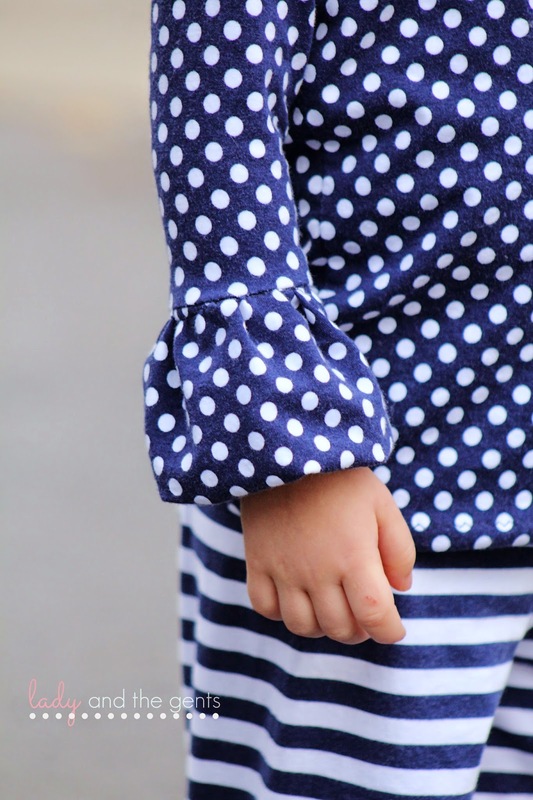 Not a fan of so many ruffles? This would be super easy to alter. To leave off however many you don't want! Or many leave off the small top ruffle and add another long ruffle! Lots of options. I love the movement these pants have. Every time she walks, jumps, twirls, it is just so fun to watch! These went together really easy! Word to the wise, use the elastic thread for these! I once again didn't ave any so I gathered by hand. It took longer, but the finished product looks great! I was nervous about these since the website says 2yrs-12yrs, but was pleasantly surprised when I opened the pdf and saw it goes all the way down to 12months! Perfect!!! I sewed up the 12month width with the 2yr length, and it is a great fit. I love the roominess of the pants. Perfect for my active little lady! Ready for the last pattern?? I know, you are all waiting on the edges of your seats, aren't you?!?!? OMG! This is my FAVORITE EVER!!! The laurelette dress is amazing. 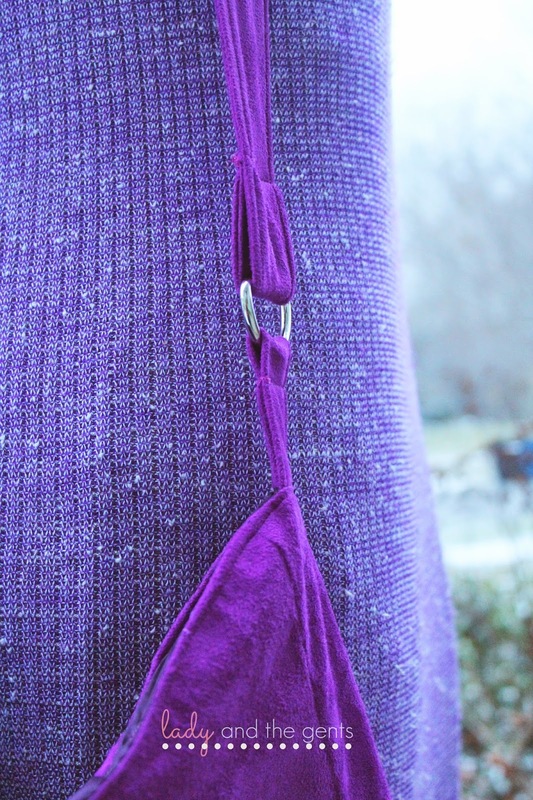 So easy to sew, so quick, so beautiful! It is one of my favorite dresses ever! And so perfect for fall. I decided to sew the pleated front, non-pleated back option. I think I will sew my next with a non-pleated front too! 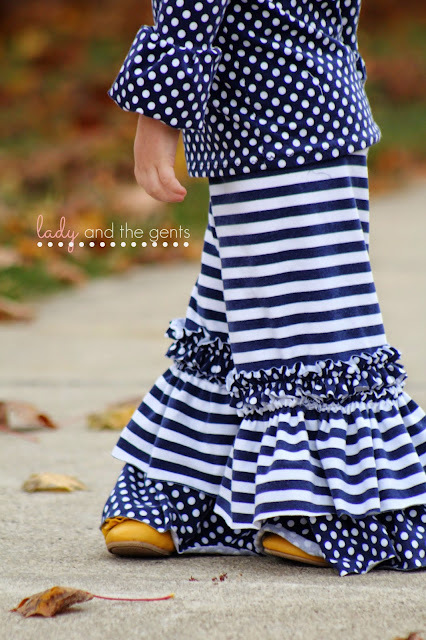 How cute would it be with a gathered skirt too???? 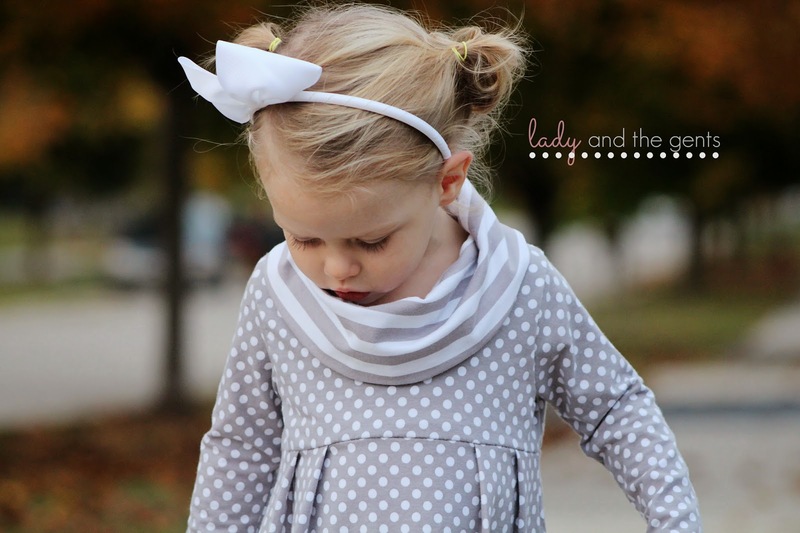 The cowl neck is just lovely! Not too roomy, but still can keep those little necks warm as the weather gets cooler! 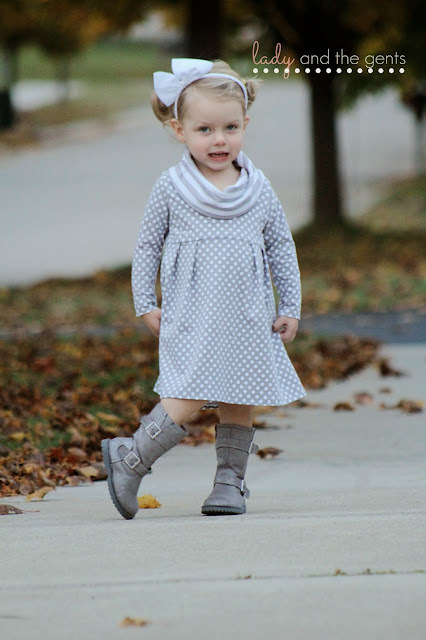 The little lady was able to easily run, jump, hop, and play in her super comfy dress! The fit was wonderful! This is the straight 12months and I love how it turned out! I was worried it may be too short, but it is the perfect length and should last her a long time! There is even a tunic length in the pattern!!! 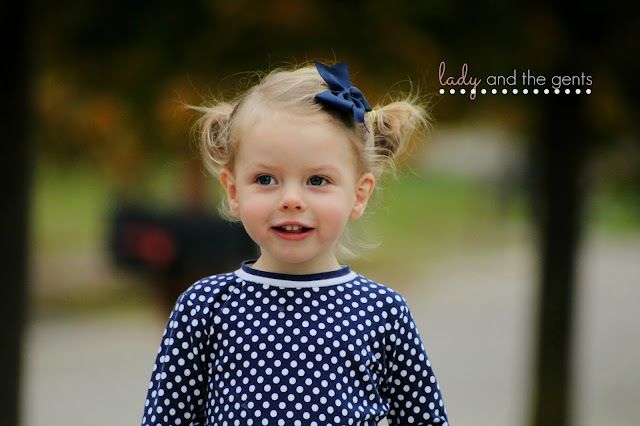 I think little ladies instinctively know how to pose...lol Little lady models are just the best! This pattern is perfect and I can't wait to make many many more! 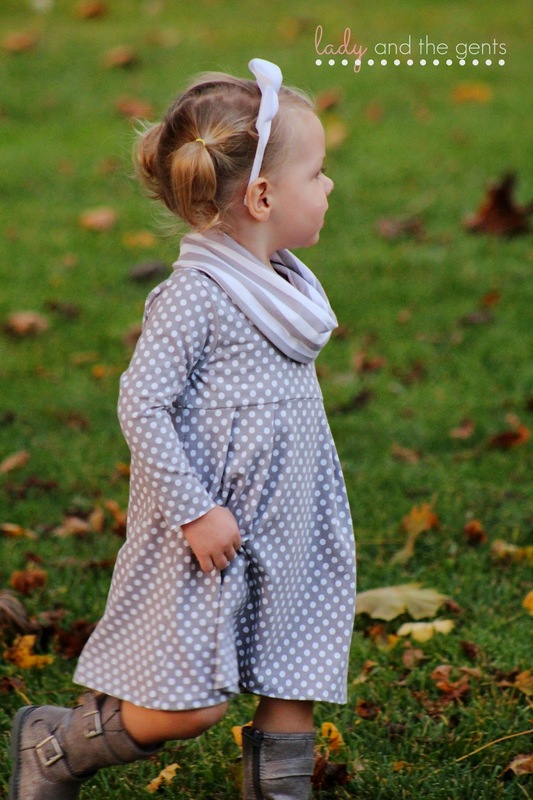 The moral of the story is, Greenstyle Creations has amazing patterns! You should definitely go get some...like NOW! And you can use code "25discount" to get 25% off your purchase during the tour! Don't forget to enter below for some amazing prizes! And please go take a minute and check out all the other amazing bloggers on the tour!